The Lake Chelan Recreation Development Foundation is very grateful to Mike Sherer for his generous offer to provide the net profits from the Certified Organic Farmers Market to our organization. 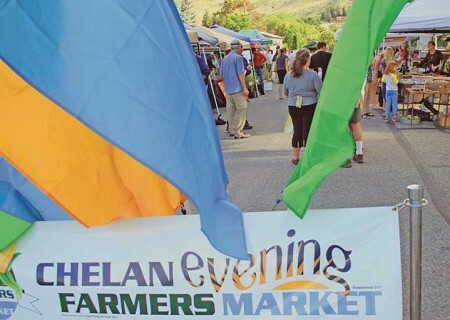 We encourage locals and visitors to the Chelan area to support the organic market, which is scheduled to open this summer. On Emerson Street between Riverwalk Inn and Riverwalk Park in downtown Chelan. May 1st through October 1st, Thursdays from 5 to 8:30 pm. Certified Organic Farmers Market. All venders must be fully Certified Organic Growers, or Organic but exempt from fees (iaw para. 205.101 of Organic Rules) and be willing to display their Food Producer Certificate/credentials at their sales location. 2. Street closure for half-block of Emerson along side of Riverwalk Inn Hotel . 9. Market Management: First year, the market will be managed by Mike Sherer. Goal for first year management of the market is to be revenue neutral. Any net profits of the market manager, however occurring, would go to Lake Chelan Recreation Development Foundation [a 501 (c)(3) tax deductable organization], dedicated to creating recreational opportunities in the Lake Chelan area. Vendors will be expected to: pay small amount for space rental; provide a sampling of products being sold to the Riverwalk Inn Hotel Chef to produce a timely meal in the hotel; and display their organic credentials at their space. a. Certified fruit growers can quickly become certified for vegetables by ordering organic seeds and complying with organic regulations as usual. A certified 2011 crop of vegetables is possible by working with Jeff Collins the local organic inspector.